Editor’s Note: This post is adapted from the RISE Medicare Marketing & Sales Summit in which Justin — DMW’s VP of Integrated Marketing — was a featured speaker. For the full presentation, watch the free webinar. I’ve been working primarily in digital marketing mediums for over 20 years. In that time, I have been part of some amazing successes. But admittedly, I have also been part of campaigns that have completely missed the mark. Over the years, I’ve come to believe that the digital marketing campaigns that have fallen short on results can usually be traced back to one of 6 fundamental issues. It’s easy for us to become excited about marketing metrics like impressions, click-thru rates, and even conversion rates. But these are what I call “soft metrics.” They are important metrics for us to gauge the success of a marketing campaign, but they are not the end result. They should not be what we hang our hats on to indicate whether or not a Medicare campaign was successful or not. This is because they only tell one side of the story and they all have one fundamental flaw: None of these metrics relate directly to revenue. I tend to think that marketing is similar to dating. For starters, you need to make the other person like you. Then they need to trust you. Then, after several interactions, and once the timing is right, you can “pop the question,” i.e. close the sale. But how many of us do this within our marketing? None of us! There’s an old concept in marketing called the “Rule of 7.” It was coined in the 1930s by the movie industry after studio bosses discovered that a certain amount of repeated advertising was needed to compel someone to want to see one of their movies. Source: Aggregated Medicare client data, Google Analytics during AEP 2019. For proof the “Rule of 7” remains valid today, take a look at the aggregated list shown. 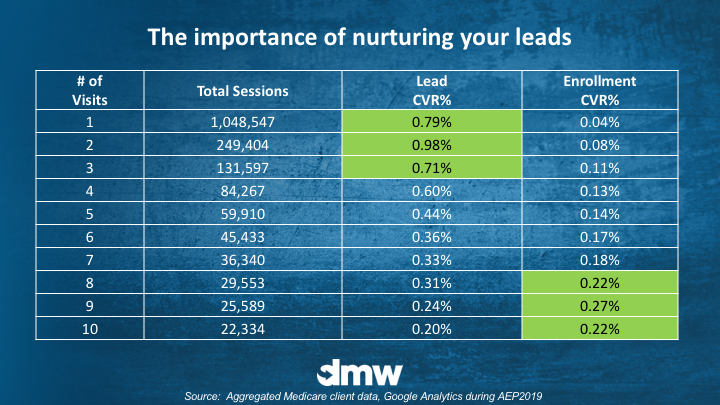 It’s from the 2019 AEP from our various Medicare insurance clients — highlighting frequency of visits versus lead and online enrollment ratios. In this particular example, a lead is a visitor who downloaded an asset after providing their contact information. When overlaying all of the data across all of our Medicare clients, there is an interesting trend … the likelihood of online enrollment is next to nothing on the 1st and 2nd visit and increases only after the 8th or 9th visit. That’s just 2 of the 6 potential pitfalls that can make your Medicare digital marketing efforts more difficult than they need to be — and resulting in less clicks, fewer leads, and higher CPLs. To see the complete list, watch the free DMW digital marketing webinar. Thinking about your next digital marketing campaign? DMW is ready to help you strategize, plan, and execute. Call or email us today!